This economic development project was a joint project between the City of Jasper and Hamilton County. The City’s portion of the project involved CDBG Economic Development funded installation of more than 5 miles of 6″ HPDE gas pipe, natural gas odorization system and regulator station to facilitate the economic development project for location of Loves Truck Stop at the US HWY 129 and I-75 interchange. NFPS provided planning services, design and permitting, Construction Inspection and management services for the main extension. The County’s portion involved FDOT required turn lanes on US Hwy 129 and a paved access roadway for ingress and egress to the Loves Truck Stop site. NFPS completed the OTTED grant applications and secured the $250,000 in Rural Infrastructure Funds for the County’s portion of the project. 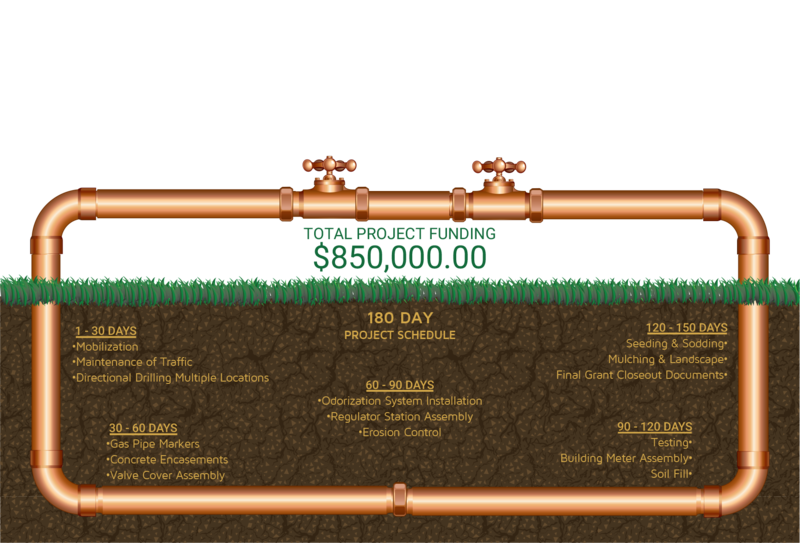 Project Timeline: Design: 90 Days. Construction: 180 days.